Cinematic Paradox: "Life is a happy song." "Life is a happy song." Starring: Jason Segel, Amy Adams, Chris Cooper, Rashida Jones, Steve Whitmire, Eric Jacobson, Dave Goelz, Bill Barretta, David Rudman, Matt Vogel. I feel like sort of an outcast. I didn't really watch the Muppets much when I was a child, in fact, I didn't watch or do much of what any normal child did. For me, I was more content riding and caring for horses than I was with anything that happened on screen. That's what I love about cinema: it is constantly introducing me to all of these things that I have missed, which I'm happy that I've found. 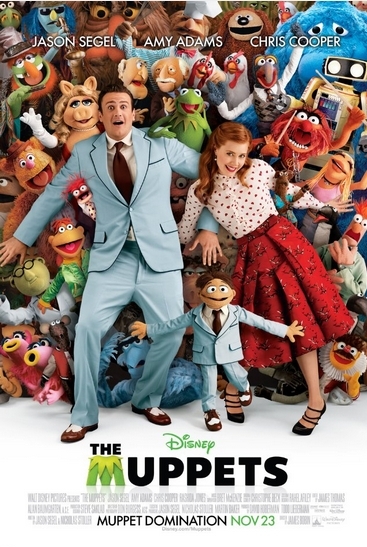 You've really got to hand it to Jason Segel and his co-writer Nicholas Stoller, who have dragged the felt favourites up from under what seems like a celluloid rock and brought the Muppets to our world and our times. Still, they remain the same as they ever were, realising that perhaps their world doesn't transfer so well to our world. And that is the beauty of The Muppets. The Muppets is quite a simple film, but not annoyingly so. The basis is that Gary (Segel), his muppet brother Walter (Peter Linz) and his girlfriend Mary (Amy Adams) go on a trip to Hollywood. Walter has idolised the Muppets for a long time, so their first stop in Hollywood is the Muppets Studio. However, when they get there, they find that the place is quite run down. Walter accidentally hears that evil oil magnate Tex Richman (Chris Cooper) is planning to buy the studio, demolish it and drill the oil from underneath. Shocked by this, Walter embarks on a journey to try and make this right, so he goes to visit Kermit the Frog. Kermit decides that the only thing to do is to get the gang back together. With the help of Gary, Mary and Walter, Kermit sets off to find all of the other Muppets and put on a telethon to save their studio. While this film is by no means perfect, it is exactly what family entertainment should be. It is a rollicking good time at the movies, with enough heart, love and laughter to go around at least 100 times. What got me the most was that it was a wonderful parody of a lot of films, which since we had all of those fake trailers is something that I was expecting. It makes fun of some of the most basic things in film, like when they decided that after a couple of Muppet-collecting that they'd make a montage about it, and then Rowlf says "hey, what about my montage?" when his is clearly quite boring. Chris Cooper's Tex Richman is a bit of a parody on villains, as he often says "maniacal laugh" to his henchmen to really push across that he is your basic villain (and we won't even get into the rap, which is the funniest thing from a 2011 film hands down). Even some of the cameo performers parody themselves, like Emily Blunt who plays Miss Piggy's assistant, which is basically another go at her character in The Devil Wears Prada, with the red hair and all. While the little kids probably won't get this kind of humour, the use of slapstick comedy (which isn't overtly used, unlike those bloody Alvin and the Chipmunks movies) and simply funny lines will ensure that they have as gooder time as you are having. The music, part of which is written by Kiwi Bret McKenzie (I actually know his father, I have connections with famous people! ), is pretty darn good. I guarantee you that it will get your feet tapping, and you will be laughing along with the truly silly lyrics which work so well. The opening song is 'Life is a Happy Song', which is impossible not to smile at. I also loved the songs 'Man or Muppet' and 'Me Party'. The performances that everyone put into these songs was so over the top and dramatic (again, a form of parody) that you can't help but be in stitches, while being totally behind what they are singing. You can see clearly through the music that The Muppets does a pretty rare thing: it takes something so simple, and then laughs in the face of its simplicity. Because of its simplicity, you can't help but be entertained. I don't think that there wasn't a moment when I wasn't smiling through this movie. Except for whenever Tex Richman was around (apart from when he was rapping, of course). I could say that it is quite entertaining, but then I would be mistaken for saying that this is one of those movies where you "turn your brain off". It is so much more than that. All that I ask is you turn your horrible cynicism off and The Muppets will reward you for being happy. Which, goodness knows, is something that the people of today need. I totally agree, we do need more comedies, more happy films, the number of dramas out there is killing me :) I think I might give this a try now, since I read your review- if not in cinemas, then most definitely DVD (big fan of Jason Segel, as well, so double win). Good review! THIS IS ME STOMPING MY FEET IN A MAJOR TANTRUM!!! I am so annoyed that this film hasn't been released here yet!! How very rude! Although I am just more excited to see it now! A great movie, but I've been a muppet fan since I was a kid. "Life's a happy song" ALWAYS cheers me up when I'm feeling down. You should check out the video of the writer singing with Kermit. It's even better than the movie. "Turn your cynicism off." Better advice for a film has never been given. I took the kids, expected little, and left very happy that I'd seen it. I haven't yet met anyone who didn't find it charming. Glad to hear you think of The Muppets so highly. I am interested to watch it now, even though I kind of avoided seeing any of the trailers and whatnot that were released for it because of my undying love for The Muppets and everything about them. And you should definitely watch the earlier films! Aziza - We really do need more happy films. This one fits the bill completely. You should definitely see it, either way! It is so much fun! Scott - Haha, we got it before you? Wow...that is a rare occurrence! Maurice - It is definitely a feel good song! And that video is just the sweetest! James - Haha, I know! I'm actually shocked about that! Steven - It's exactly right. Cynicism will get you nowhere in this movie! If anyone wasn't charmed by it, they should seriously get their heart checked! Cherokee - I will watch their earlier films! But this one is really good! Sooooo looking forward to this one! I didn't exactly grow up with the Muppets per se, but I watched Muppet Treasure Island and Muppets in Space a lot. That's where my knowledge of them comes from, and my sis has recently bought the original series on DVD. Jason Segel is awesome! I was beginning to wonder how this film would play to someone who had no history with the property. Thus I was happy to read how much you enjoyed the film! Like you, I was smiling through the entire film...except of course for the moments where I was in tears. Listening to Kermit pine for happier times during "Pictures in my Head" turned me into a blubbering mess, as did the whole fuzzy cast tapdanced on my nostalgic heart by singing "Rainbow Connection". If you want to get the perspective of someone who *did* grow up with Henson's creations, you know where to find it...and if you want another few doses of joy, queue up THE MUPPET MOVIE and MUPPETS TAKE MANHATTAN. Glad you finally got around to see this Stevee and happy that you liked it! Overall, just a rollicking good time as you put it. Always nice to see that Hollywood can do these kind of movies without ruining it with too much cynicism or self-irony ala Shrek. Ruth - Get down to the cinemas on the 12th and you'll have a blast. It is brilliant! Ryan - Yes, I definitely enjoyed it! The Rainbow Connection song made me tear up. I think the entire audience was like that. I will definitely queue those ones up! Castor - Yes, that is exactly right. There is way too much cynicism in the world, and this movie doesn't add to it. Very good review! This is coming out in a week or so where I live and I can't wait to see it. :O you know Brett MacKenzies father??!!! That's so cool! I really liked the old Muppet films that I've seen, so I'm pretty keen to give this one a watch at some time!